Description: Most desired highlands location steps away from famous cherokee park! This stunning 3-story, north-facing home exemplifies the classical elements of original american four-square homes while having all of the modern conveniences today's buyer expects! Tons of natural light throughout, recessed lighting, built-ins, new geo-hvac system, new water lines, gas, and new electric. Original redwood inlays, moldings and banisters. 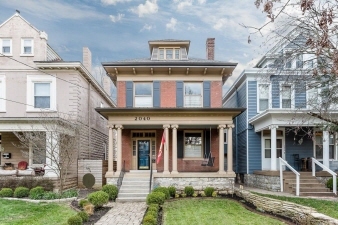 This is a phenomenal location close to parks, restaurants, and steps to public transit. The 1st flr has a living room, dining room, updated kitchen, 1/2 bath and entrance room, 2nd flr has a master bedroom with private bath and walk-in closet/baby's room, guest room with separate full bath. The 3rd flr offers a 2nd master bedroom, full bath and storage.